Curator and collector Vladimir Semenikhin collects and preserves children’s book illustrations and experiments with how books can be enjoyed in a digital future. Vladimir Semenikhin welcomes me into his lair with childlike glee, which is fitting since he is fresh from a successful recent exhibition in New York, showcasing the experimental art of Russian children’s books. Semenikhin’s experimentation reflects the spirit of his own collection, which focuses on children’s book illustrations from the period 1881 – 1939, charting the move from Russian Art Nouveau under the Tsars to the highly experimental post-revolution forms of Suprematism and Constructivism. Children’s books flourished as an industry under the Bolsheviks as part of a drive to stamp out illiteracy, spearheaded by Nadezhda Krupskaya, Lenin’s wife and a former schoolteacher. Their illustrations remained relatively free of censorship until the 1930’s, when Stalin became wary of the avantgarde and declared many illustrators “enemies of the people,” exiling them and destroying their work. “I’m an archeologist,” says Semenikhin proudly, as he shows me rare works by the likes of Ivan Bilibin, El Lissitzky, and Gustav Klutsis. They range from beautifully detailed forest scenes to brightly colored abstract compositions that have lost none of their modernity. Semenikhin tantalizes me with the idea that the Russian artists and writers of the 20th century would have grown up with these illustrations, being influenced by them and reflecting this through their work. He extends this to émigrés such as Alexey Brodovitch, who transformed Harper’s Bazaar, and who Semenikhin names as influential on American typography. Semenikhin is passionate, not just about the power of illustrations to influence culture and society, but about the importance of physical books on children’s development. As part of the exhibition Semenikhin also showed art created by children themselves. He explains that children who draw and sculpt from early childhood are capable of creating works comparable to that of the avantgarde masters. He sees the physical handling of books as vital to this process, suggesting that children who only use electronic books will develop much more slowly and lose the dexterity in their fingers. I think he’s speaking metaphorically, but he disappears for a moment and returns with a wooden chest. While believing that physical books should be saved, Semenikhin is a firm advocate of technology, assuring me that he owns an iPad and a Kindle, describing them as “very handy and multi-functional.” He is also quick to remind me that technology opens up boundless possibilities for experimentation. It is at this point that his longtime friend and colleague Kirill Fesenko leans over conspiratorially and invites me to see how they experiment with technology. 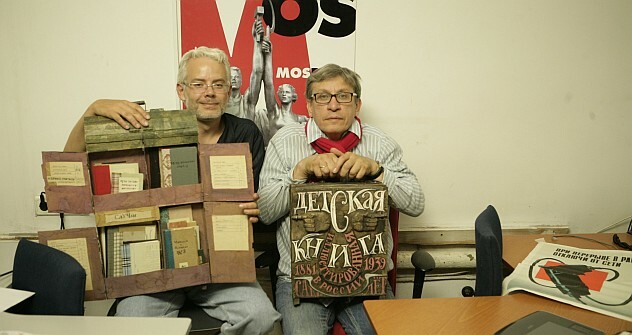 Semenikhin and Fesenko are currently working with researchers and libraries to scan thousands of rare publications and have implemented a method of browsing that allows students and scholars in different fields to quickly search through the collections. As Fesenko states, “this is a project to save and catalogue but also to innovate.” He shows me a scanned copy of a rare children’s story, complete with thumbprints and an ancient library stamp. He explains that the opportunities offered by technology give it a new life. He clicks a button and I hear a woman’s voice start to tell the story. “It reads itself.” He proclaims triumphantly. Through such applications, Fesenko and Semenikhin show that technology can in some ways improve on the original, as well as making rare specimens available to a wider audience. As our discussion draws to a close I am shown more experimental books in paper form, some substituting geometric shapes and cut-outs for words.